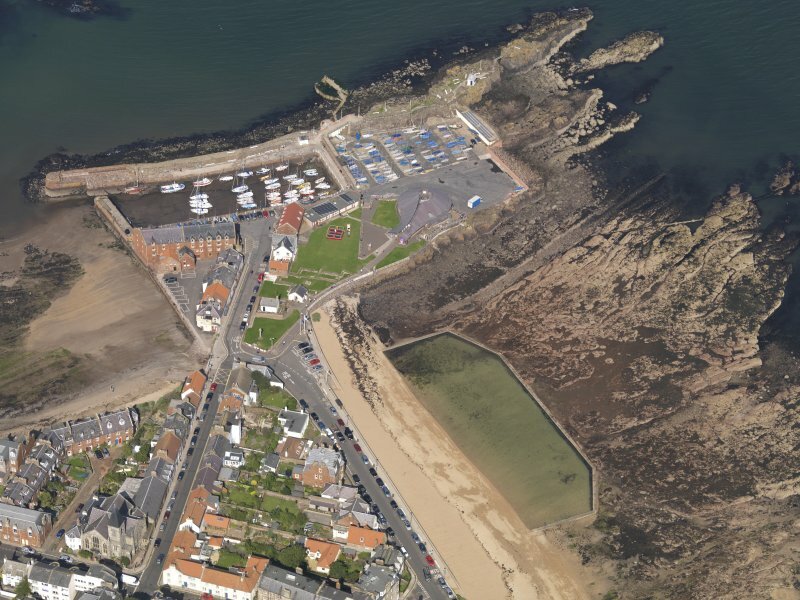 Oblique aerial view centred on North Berwick harbour area, taken from the SE. 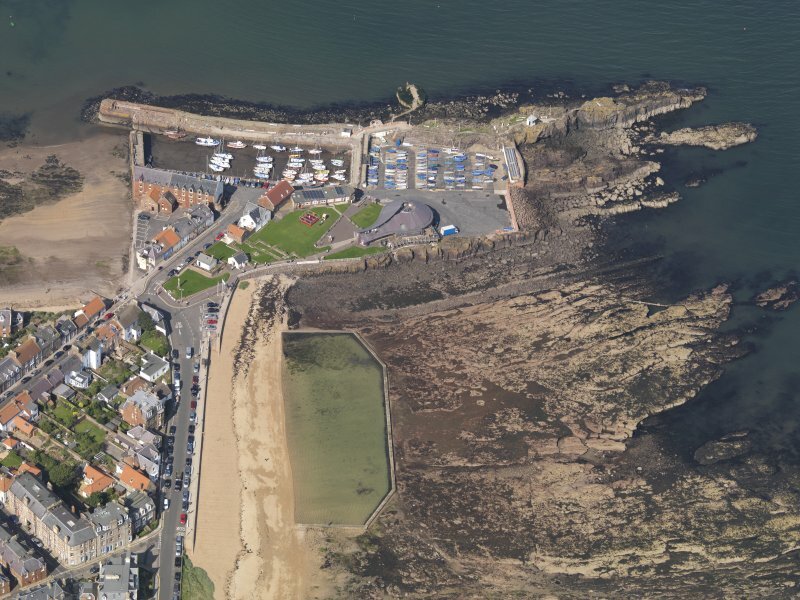 Oblique aerial view centred on North Berwick harbour area, taken from the E.
Oblique aerial view centred on North Berwick harbour area, taken from the NE. 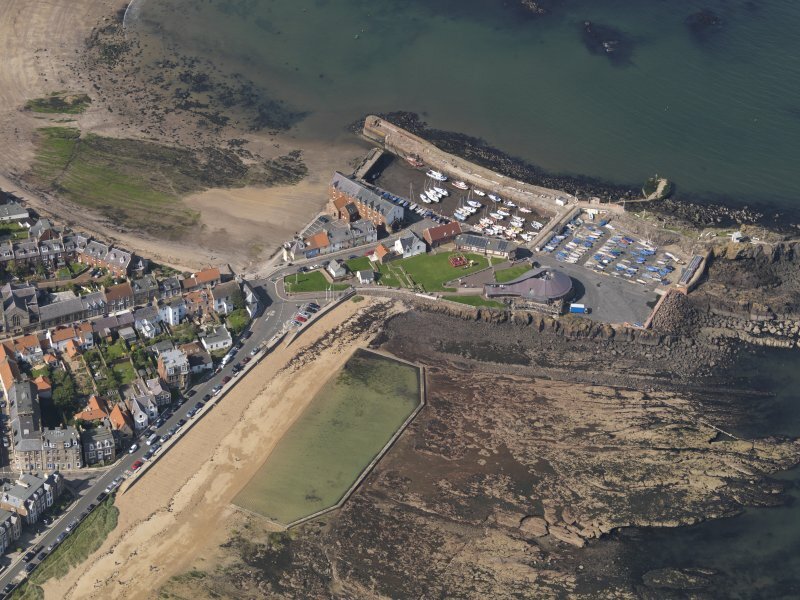 Oblique aerial view centred on North Berwick harbour area, taken from the W.
For successor church (NT 55342 85229), see NT58NE 2.00. For (possibly-associated) remains of graveyard found during trial excavations (2004) at NT 5541 8562, see NT58NE 70. The only portion remaining of St Andrew's Church is a small one-storeyed, rubble-built, vaulted structure which once projected from the S wall of the church. It is oblong on plan, measuring 19ft N-S by 18ft transversely, and has a central buttress which projects 2ft 9 ins from each of the lateral walls. In the S gable is a doorway with a semi-circular head; on the N gable the opening has been widened, though the original W jamb is in situ and shows that this doorway also had a semi-circular head. The mouldings date to the 16th century. In the NW angle a fireplace has been inserted, and in the E jamb of the S doorway there is a stone basin. Two fragments of a grave slab (c. 13th century) are preserved within the structure, while a third fragment has been built into the coping of the boundary wall of the swimming pool. Much of the associated graveyard has been eroded by the sea. In it was found a piece of a stone mould for making pilgrim's badges and ring brooches. The church, first mentioned prior to 1177, was in ruins by 1656, and was replaced by the church described on NT58NE 2 in 1659. F Grose 1789; RCAHMS 1924, visited 1919. These remains are generally as described. Foundations of the N and S aisles, the tower and part of the nave have been excavated and preserved, the walls standing 0.3 to 1.0m in height. The site of this church was excavated by the late Dr J S Richardson in 1951. When first built it consisted of a nave, choir and presbytery. Later, a tower was added at the W end and there followed the substitution of arcading on the line of the original side walls of the nave when the building was widened to give a N and S aisle. A porch was built on the S side. A collection of early grave stones has been made, most of them now in North Berwick Museum, the remainder being set out in St Ninian's Aisle of the church. One of those in the museum, a small upright slab bearing an incised cross on both sides, is thought to be of about 9th or 10th century date. The mould for making pilgrim's badges is also in North Berwick Museum. Following the excavation of the foundations of the church in 1951, substantial repairs and some reconstruction work was carried out, characterised by the use of cementitious mortar. Close to the harbour stood the ancient burgh church, dedicated to St.Andrew. In modern times the only part of the church still standing has been the little white-washed south porch, although an excavation conducted by J.S. Richardson revealed the foundation and bases of the old walls (Anon, n.d.,34). The church at the harbour was in use until the year 1656. 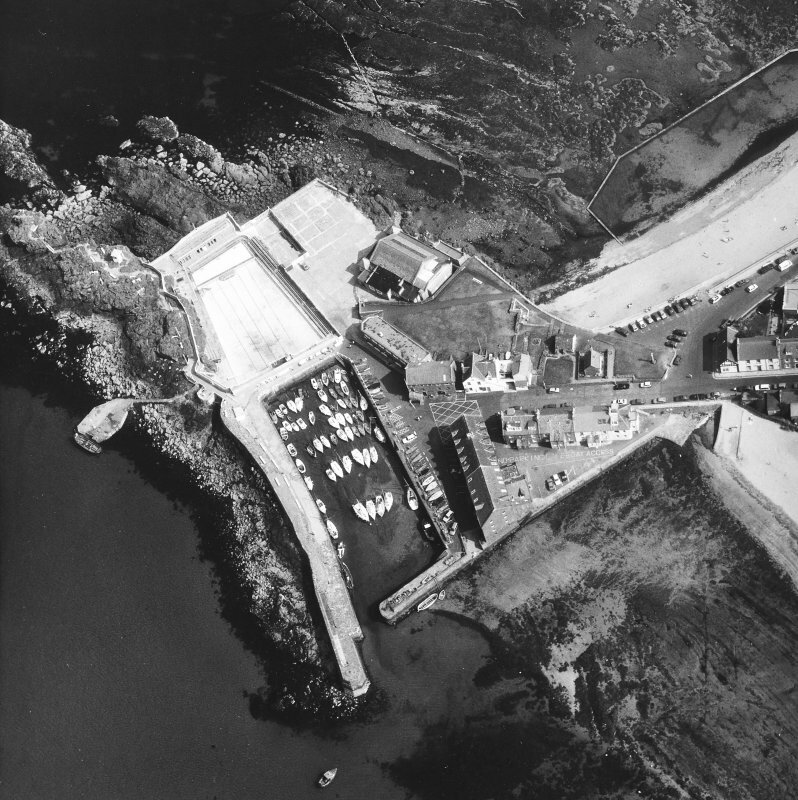 Information from ‘Historic North Berwick: The Archaeological Implications of Development’ (1981). Single storey oblong structure of random rubble construction, with doorway mouldings dated to the 16th century. Roofed with slate. Interpreted as the porch of the 13th century parish church. In 1924 RCAHMS reported that the graveyard was eroding into the sea. Early gravestones from the site have been moved to North Berwick Museum, the remainder have been placed within the church. Finds from the site include a 13th century grave slab, a mould for making pilgrim's badges, and an incised cross slab of 9th or 10th century date. The site is as described in RCAHMS, it lies in a grassy area with information boards and is maintained as a tourist attraction. RCAHMS 1924 57-8 no 103. 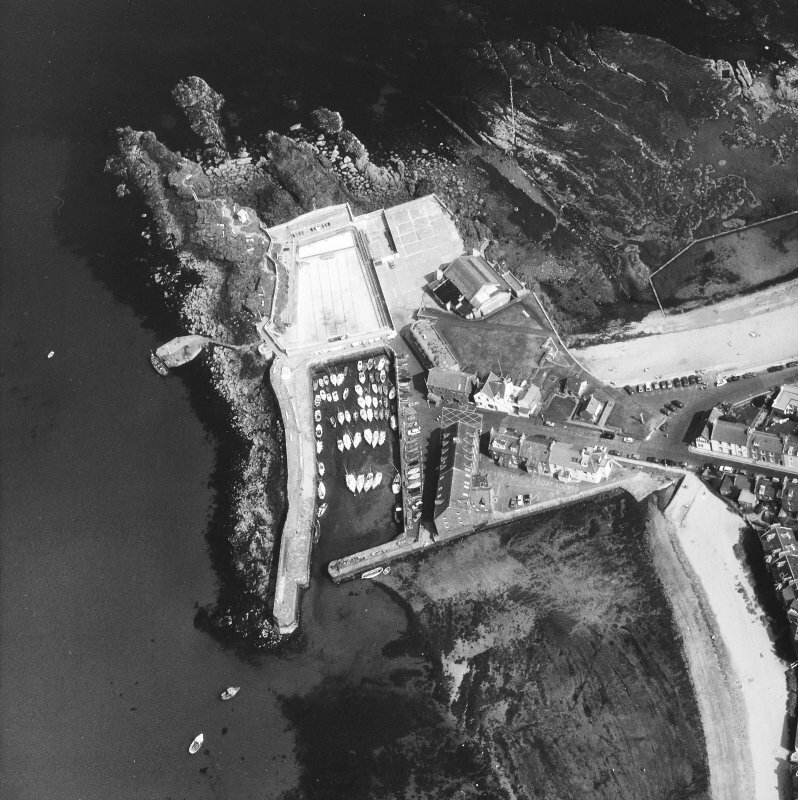 Site recorded by GUARD during the Coastal Assessment Survey for Historic Scotland, 'The Firth of Forth from Dunbar to the Coast of Fife' 18th February 1996. 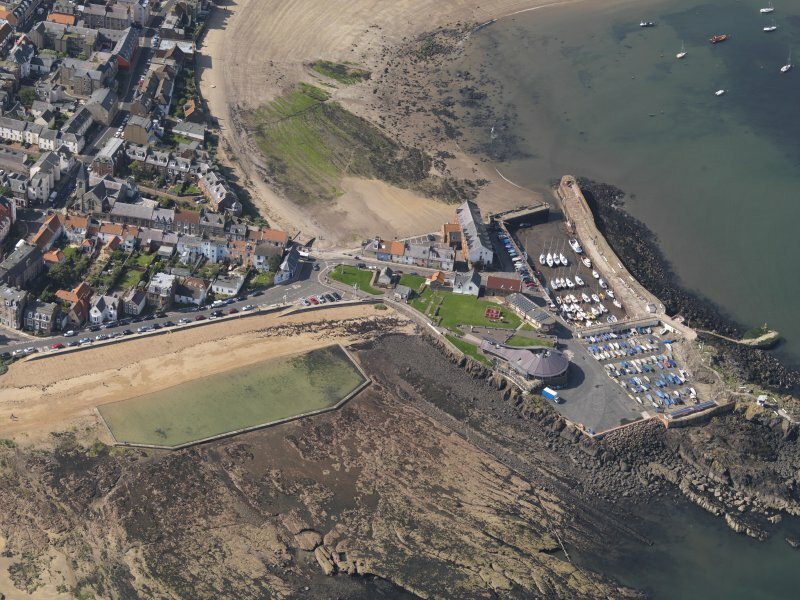 A four phased project associated with the construction of the Scottish Seabird Centre, North Berwick. Work undertaken by Addyman Associates and sponsored by Historic Scotland and the Scottish Seabird Centre. 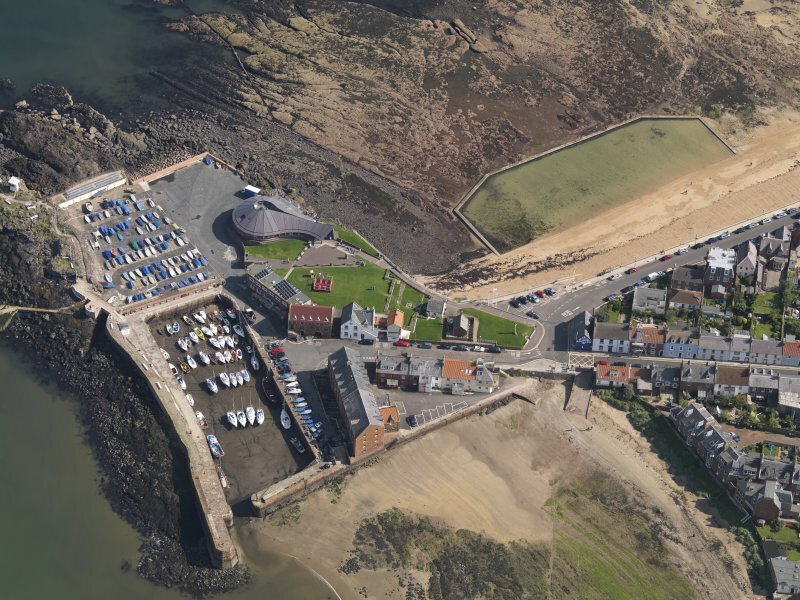 Four evaluation trenches were excavated in June 1999 along the sea wall bounding the E side of the ruin of St Andrew's Old Church and its former churchyard (NMRS NT 58 NE 3). The E limit of in situ archaeological deposits was defined following the excavation of late 19th-century fill behind the sea wall in three of the trenches. This edge represented the extent of coastal erosion up to the mid-19th century. A charnel pit was located in Trench 2, adjacent to the original N transept, that contained the remains of some 30 inhumations, considered to have been the product of excavations of the church site in the early 1950s by J Richardson. Three in situ inhumations were also identified 0.3m below the existing surface but were left undisturbed. 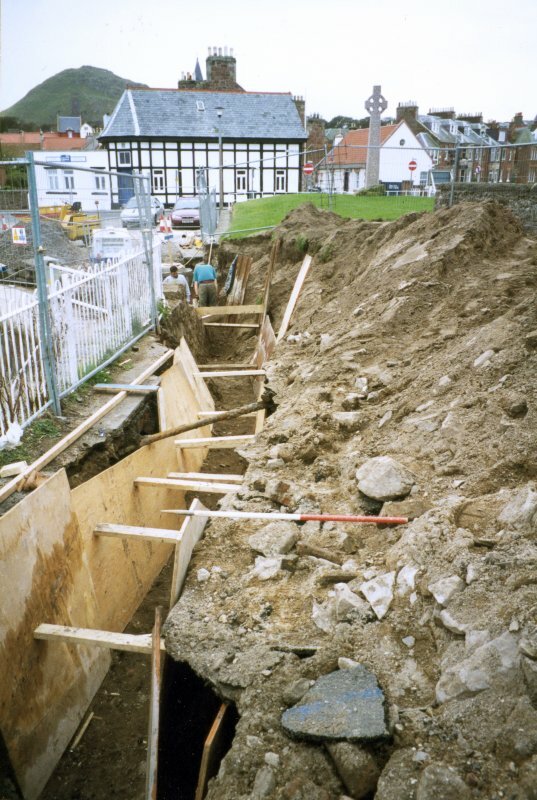 The excavation of a service trench behind the sea wall was monitored in October 1999. Two significant finds were made: a dump of disarticulated human remains to the E of the porch, redeposited following the construction of the sea wall; and a group of inhumations within in situ archaeological deposits to the NE of the N transept and approximately 1m below the present surface. Of the inhumations, six were fully excavated (all damaged by coastal erosion) and three further grave cuts identified. An open area excavation of some 150m2 was conducted in January and February 2000 on the N side of the church ruin to accommodate the access requirements for the new building. A total of 21 inhumations and two dog skeletons were exhumed - principally from the S end of the site where archaeological deposits were found almost immediately below existing topsoil, where landscaping work in 1951 had reduced the ground level. A number of further grave cuts were also identified. As with the previously described inhumations, this group was probably interred within the period of use of the existing church remains, between the 12th and 17th centuries, in this case probably at the latter end of this period. An extensive osteological assessment has been completed, a notable result of which was the identification of the violent death by stabbing of a young male individual. Various episodes of post-graveyard activity were identified including various landfills, a substantial ditch, and the brick bottoming of a path of relatively recent origin. A soil test pit within the N half of the site revealed a full depth for the graveyard levels, above a carbonised deposit representing earlier human activity on the site (sampled for radiocarbon dating), which overlay a sequence of coastal-derived geological layers. 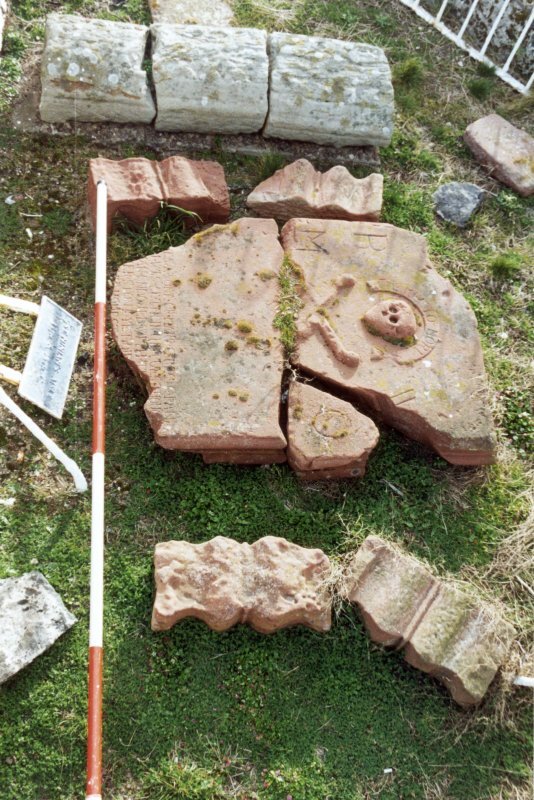 A drawn survey and analysis of the existing ruins of St Andrew's Old Church was carried out in March 2000. This revealed the structure to be of four principal phases: a probable cruciform church, probably 12th century; the addition of a W tower; the formation of nave aisles and arcades; and the addition of the existing S porch, perhaps in the 16th century. Nt 5540 8556 Archaeological monitoring was undertaken between October 2003 and May 2004 during ruin consolidation. A series of minor interventions revealed details of the interior wall faces of the N transept, including interior plasterwork and part of an in situ inhumation at the NE corner of the font plinth (not disturbed further). A further analysis of the church ruin (see also DES 2000, 27-8) suggests that the N aisle was a secondary construction reusing Romanesque stonework. NT 55402 85555 A historic building survey was undertaken, 7 June–28 October 2010, prior to the removal of the decayed tower roof, for health and safety reasons, from this Category B listed building and scheduled ancient monument. Built as a cross-shaped church between 1658 and 1664, a square bell tower was added to the W gable in 1770, accompanied by some selected rebuilding of the main church fabric. It was abandoned in 1878 and left to decay following the sale of the interior and roof materials in the 1880s. The roof and the interior of the main church were removed, as were the N and S transepts, which were replaced with family burial plots. The roof of the bell tower will be removed soon, and although some timber floors are still present, the original timber stair no longer exists. The level 2–3 survey consisted of the production of a photographic, drawn and written record of the kirk and tower. A detailed drawing of the underside of the roof of the tower was also produced.